With summers just round the corner, it is now time to clear out the winter skin-care products from your cosmetics bag and replace it with Summer essentials. And, when I say summer essentials, the most important item is the Sunscreen Cream. Summer sun causes a lot of damage to the skin. The harmful UV A and UV B rays not only burn your skin but also make it more prone to premature ageing, skin cancer and malignant melanoma. Therefore, it is absolutely necessary to cover your skin with a good layer of Sunscreen Cream. Now, Sunscreen products come in different forms. There is the lotion, the gel, the cream, and many more. But we will talk about that and the various ways of protecting your skin from sun damage in a separate post. In this post, my main purpose is to review an excellent Sunscreen Cream for you. By now you would have heard and read about the Astaberry Brand. I have previously done reviews of Astaberry Products here, here, here and here. Astaberry Biosciences has recently launched Astaberry Papaya Sunscreen Crème with SPF 18. Today's post is a review of this product. Works as a skin brightening formula and heals dark spots and pigmentation. Reduces the appearance of skin tan, blemishes and freckles. Apply gently on all exposed areas of the skin at least 15 minutes before stepping out in the sun. I have been using the Astaberry Papaya Sunscreen Cream for over 15 days now. This product is absolutely light weight and non greasy for normal to dry skin. People with oily skin may find it slightly greasy but not too much. The texture of this sunscreen is creamy and slightly runny and blends perfectly to the skin. It is white in colour and smells amazing. The tube has a flip top cap that is tight enough and hence is travel friendly. For a sunscreen cream to work really well, you need to apply it two to three times daily depending on the intensity of the sun rays. If I go out for longer periods and have to stay exposed in the sun for long, I prefer applying it on regular intervals of at least 2.5 to 3 hours. But again, you can vary your application between 3- 4 hours as well. Ideally, this sunscreen cream is long lasting and water resistant. It removes blemishes significantly and treats dark spots and pigmentation really effectively. But, off course you need to be patient. Also, since this is a herbal product, it is extremely skin friendly, and is suitable for all skin types. It moisturizes and hydrates your skin as well making it feel more radiant. This product is available on all major departmental stores as well as online portals across the country. Rating: I would rate this product 4 out of 5 because it is better than most drugstore sunscreen creams that promise a matte look but end up being greasy and heavy on the skin. This one at least keeps up to its promises and claims. Note: Astaberry Biosciences was kind enough to send me 2 free tubes of the Astaberry Papaya sunscreen Creme with SPF 18. However, I review a product only after using it and all my reviews are 100% genuine and based on my experience using them. I do a lot of DIY Fashion and Beauty Stuff and Quick Reviews and other amazing stuff on my SnapChat and Instagram Stories. Do not forget to follow me there. Hope you enjoyed reading this post. Comment below and share with me the names of your favourite Sunscreen Creams. If you want me to review any product or services, feel free to comment below and I will be more than happy to accommodate your requests. Addons- For a perfect Style Statement. 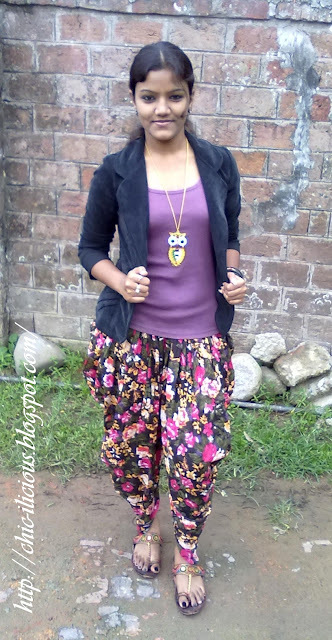 Pretty in Print with Dhoti Pant. Jabong.com- An Online Shopping Extravaganza.